I am husband to Gail, a Deacon in the Roman Catholic Church, an IT Director and I hope servant to all. Gail and I live in a 200 year old Gate House in Bristol, England. We worship and serve in Clifton Diocese in a communion of parishes including St John Fisher in Frenchay, St Augustine of Canterbury in Downend, Our Lady of Lourdes in Kingswood, St Lawrence in Chipping Sodbury and St Paul's in Yate. I was ordained in 2011 after what seemed a long journey for Gail and I. On several occasions we felt we were never going to get there, or that we were not ready for the responsibility. Ordination is a huge commitment and a wonderful privilege. I started my journey in 2001 when I went to a friend’s funeral, while there I felt something good in the church. I was not a Christian then but I felt compelled to ask the priest about Christianity. He directed me to the parish Rite of Christian Initiation of Adults (RCIA) programme and over the following six months I found Christ in the smiles of the people of St Augustine’s parish. I started going to bible study at a friend’s house and met Gail there, we fell for each other instantly and were married in 2002. My faith continued to guide and challenge me leading me to help homeless people in Bristol by going out on soup runs. I also started to help teach occasionally at courses helping people to know more about their faith. It was also suggested that Gail and I attend the two year liturgy course run by our diocese. You can see here the start of my formation, the three fold ministry of the deacon is service to liturgy, word and charity. 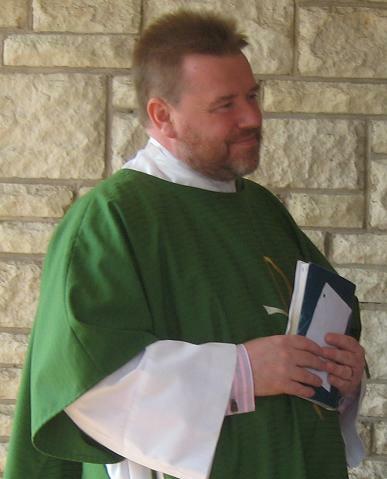 The role of deacon is unique for it combines a clerical role in the life of the Church with a secular family and working life. Ordination was not be a point where I gave up work to dedicate my life solely to the Church, it was more a point where Gail and I had to find new ways to balance the family, work and Church demands on our life and time. My work is varied and will include feeding homeless people on the soup run, performing baptisms, weddings and funerals, proclaiming and preaching about the gospels, and a bit of computer techy stuff like this blog which is currently read by over 1500 people a week. In fact anything may be asked, during formation I have visited prisons and hospital and even been interviewed on BBC Radio Bristol. Ordination has been a precious gift, and it's right up there with marrying Gail as one of the best things I have done with my life.